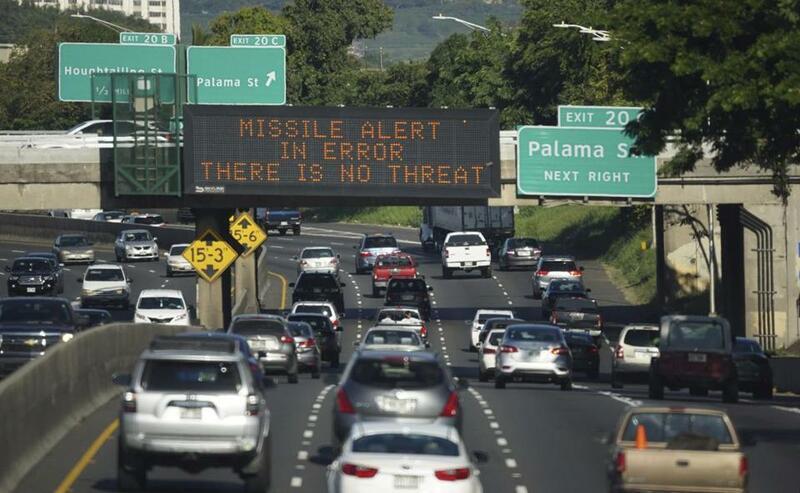 A sign in Hawaii earlier this month informed motorists about the false alert. Minutes after the Hawaii Emergency Management Agency mistakenly sent a missile alert at 8:07 a.m. on Jan. 13 - terrifying residents and visitors across the state - some officials, such as Rep. Tulsi Gabbard, D-Hawaii, rushed to Twitter to reassure everyone it was a mistake. ‘‘I have to confess that I don’t know my Twitter account log-ons and the passwords, so certainly that’s one of the changes that I’ve made,’’ Ige said. ‘‘I’ve been putting that on my phone so that we can access the social media directly,’’ Ige said. ‘‘The menu, which triggers alerts, contains a jumble of options, ranging from Amber alerts to Tsunami warnings to road closures. Some of them, such as ‘High Surf Warning North Shores,’ are in plain English.